I’m back from my Denmark trip! But before blogging about it, let me bring you to Italy first! X and I had a one-week holiday in beautiful Italy this year during the Easter holidays in April. It had been 4 years since we last set foot in Italy – it was our graduation trip and we visited Rome, Florence, Pisa and Venice. Being just-graduated students with limited spending power, I remembered I had to choose carefully what to eat everyday, and it was a little torturous for a foodie like me, not being able to gorge to my heart’s content. For our trip to Italy this time, X planned for us to visit Naples and the coastal towns along the Amalfi Coast. Here is day 1 of our trip – and we started the trip with my favourite thing to do while on a holiday – eating! 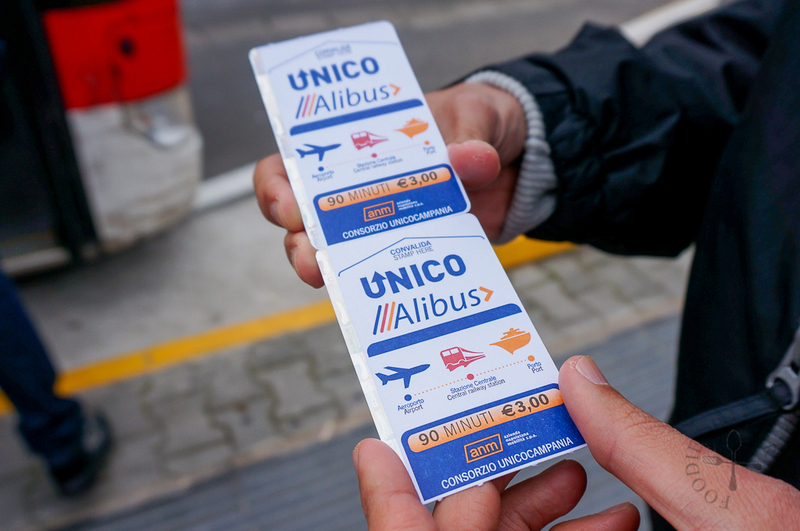 After collecting our luggage at Naples International airport, we headed to a news-stand located in a corner within the airport to purchase our Alibus tickets. The Naples Alibus Airport Shuttle ferry passengers between the airport, Central Railway Station and the Naples Molo Beverello Port, which is a very convenient and cheap way to travel to central Naples. We purchased our tickets from the news-stand at €3. If the tickets are purchased on board the bus it will cost €4. The tickets are available in most tabacchi (Italian for tobacco shops) or news-stand near the pickup points. We then took the exit next to the news-stand and head towards McDonald, where the bus is waiting at the bus-stop. For more information on the Alibus, click here! After dropping our luggage at our BnB, we immediately head out in search for food – it was already past 1 p.m. and we were famished! 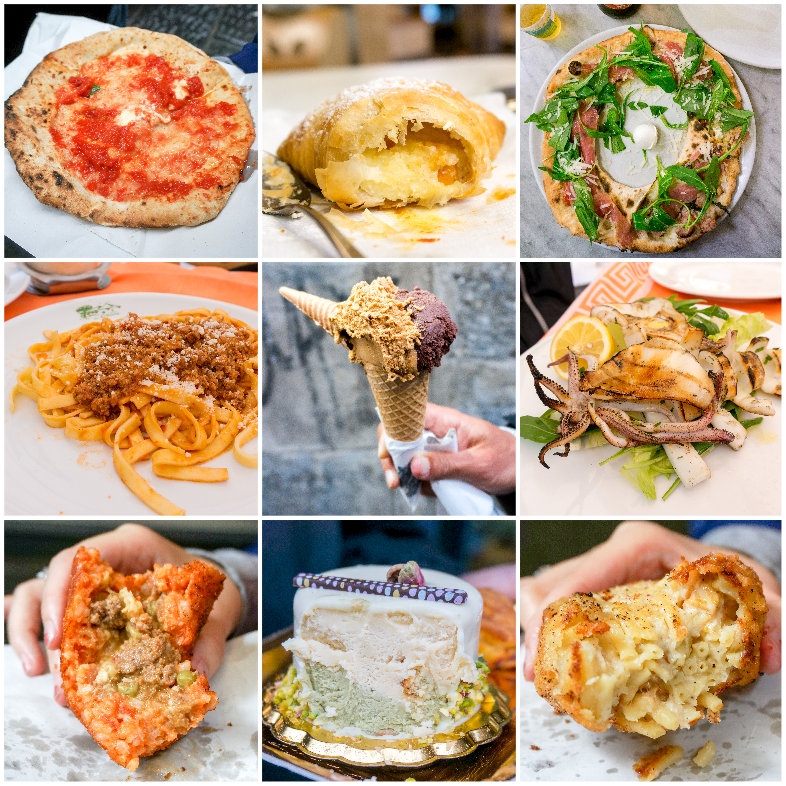 As we had another day to explore Naples at the end of the trip, our main plan for Day 1 is to feast until I’m satisfied, the perfect plan for me heh. 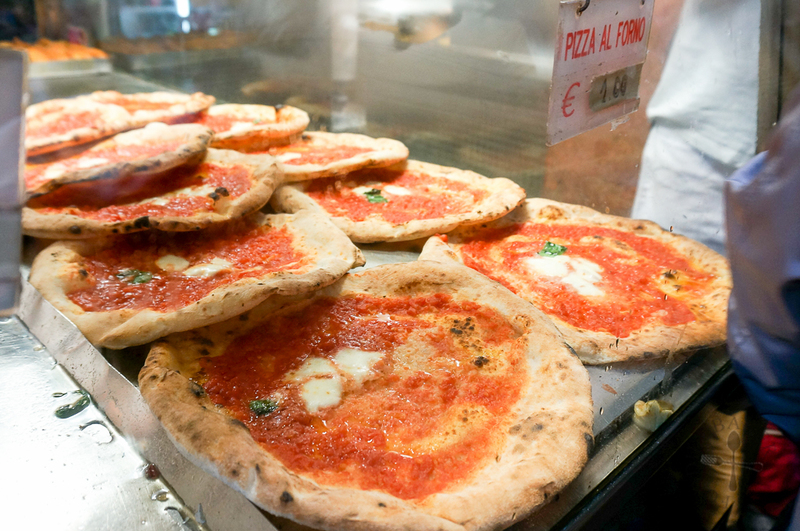 We passed by L’Antica Pizzeria da Michele, a pizzeria made popular because of Eat, Pray, Love. Did you see the little colourful umbrellas outside the shop? They are all queuing for a seat in the pizzeria! To be honest, I’m not someone who’s willing to queue for hours for a restaurant – usually my expectation for the food will increase as the waiting time increases, which more often than not will lead to disappointment at the end. 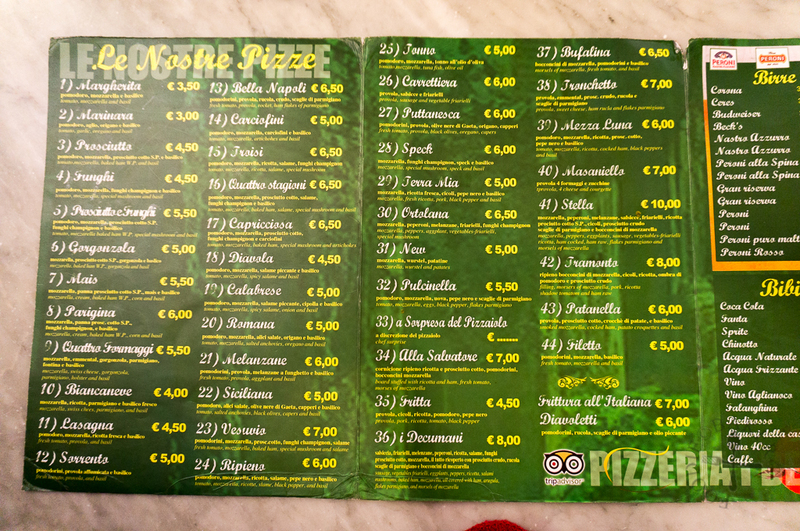 And I’m sure there are many equally good pizzerias in Naples – so in the end we decided to skip this place. If you had the chance to dine here, let me know how it goes! 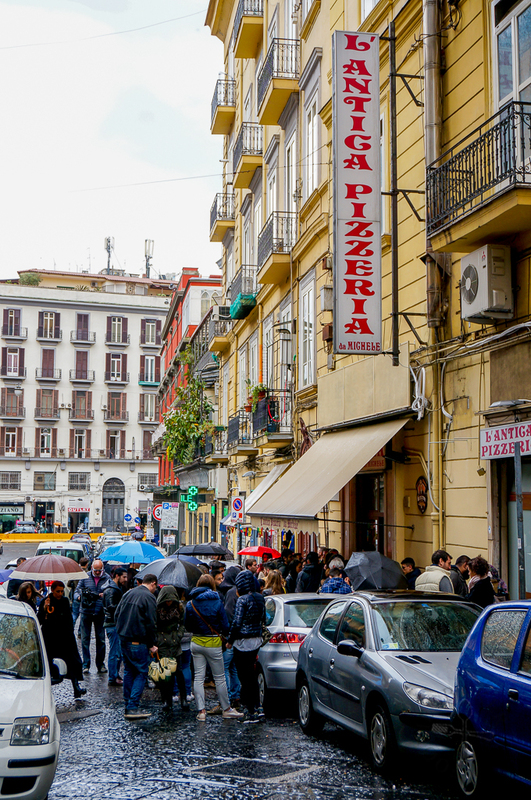 We headed to Via dei Tribunali, a popular street in the old historic center of Naples. There are many pizzerias and eateries along the street but the one I was aiming for was Di Matteo. 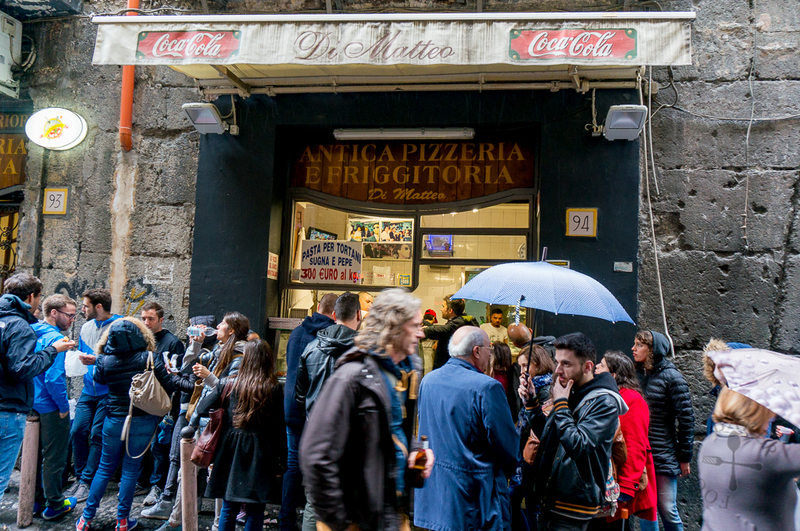 Di Matteo, opened in 1936, is an extremely popular pizzeria and it is evident from the crowd that gathered in front of the entrance, ordering the €1 fritti (which means “fried” in Italian) and mini margherita pizzas. Yes, €1! I couldn’t believe it either when I saw how cheap the food are priced. I squeezed my way through the crowd (there was no queue, it’s more of a “see if you can catch the server’s attention” kind of ordering system) and when it’s finally my turn, I pointed at every thing on display and said “uno”, meaning “one” in Italian. 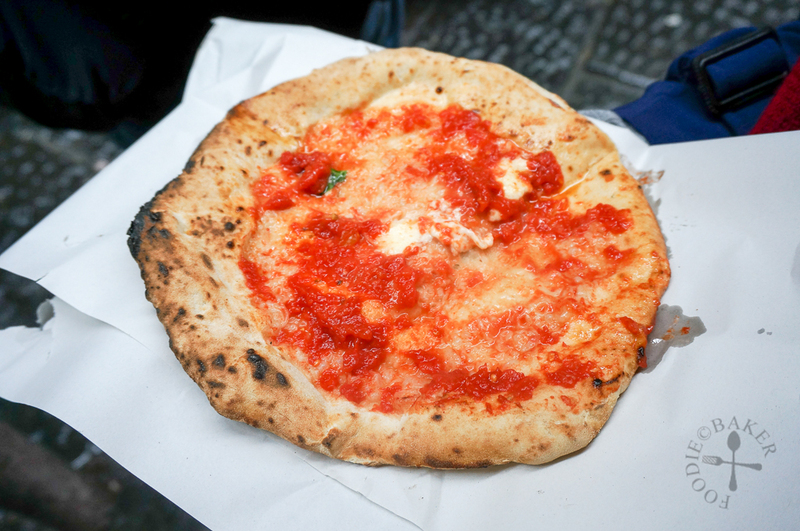 Here’s our pizza – about as big as my face. The pizza crust is crisp and slightly charred on the edges with generous amount of homemade sweet and sour tomato sauce. The middle is soft and chewy but not soggy. Simple and satisfying. 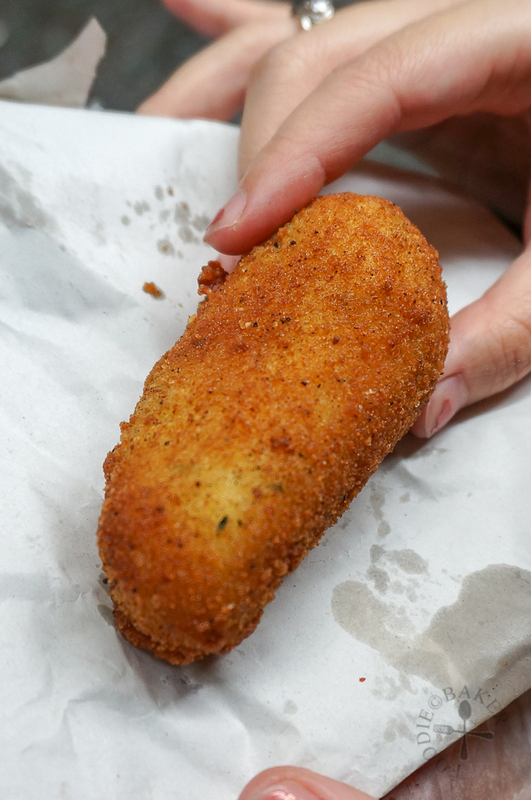 Crochette is well, croquette in Italian. 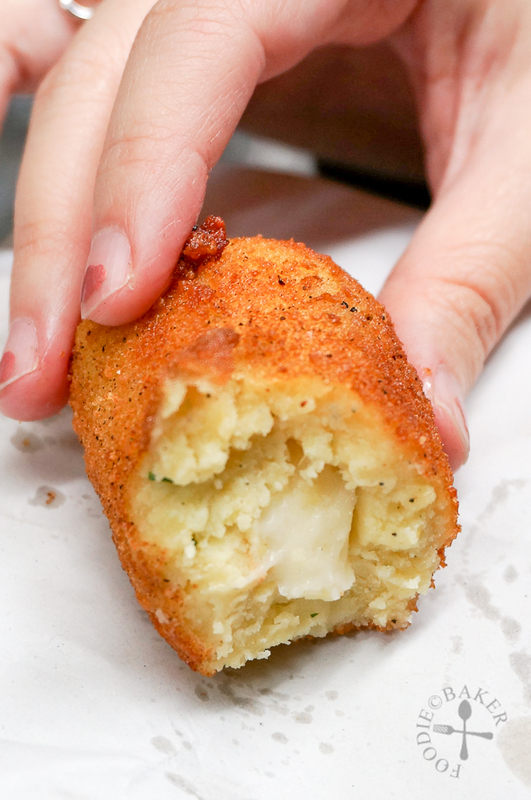 Though there’s mozzarella cheese being wrapped in the mashed potatoes, it was no longer hot, hence didn’t taste very special. This was also cheaper, at €0.50 per piece. 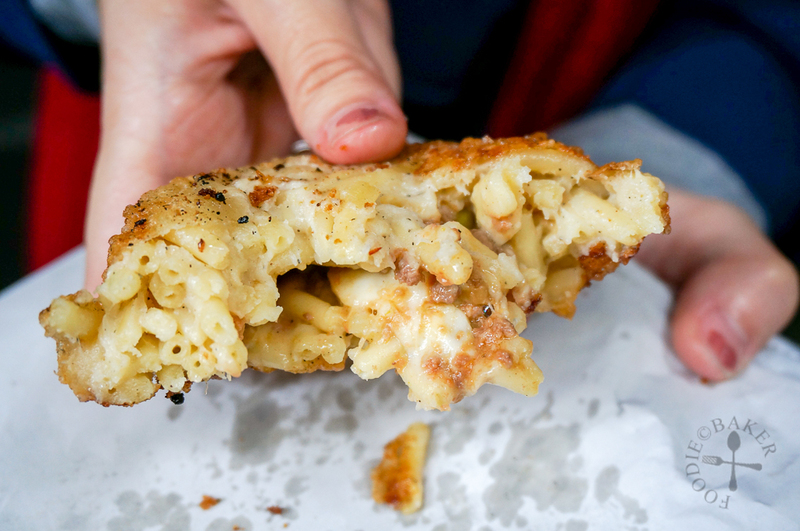 Have you ever tried deep-fried pasta before? 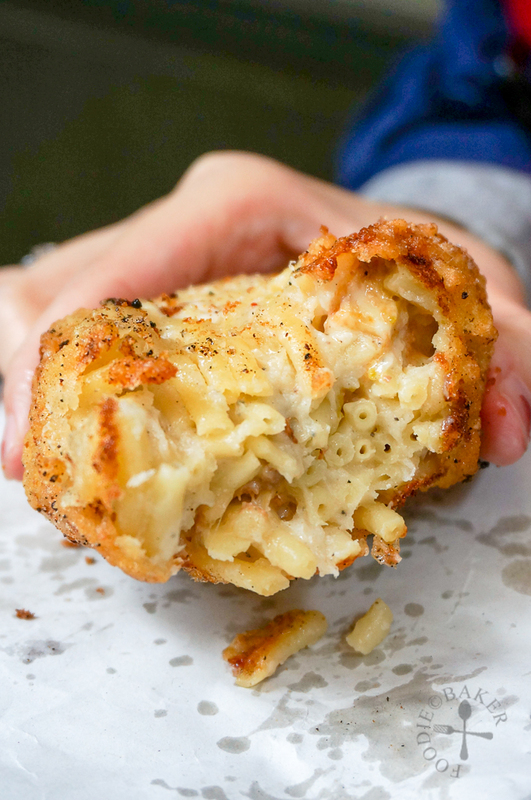 These frittatina are cooked tubular pasta mixed with mozzarella and meat, coated in a creamy sauce (I suspect béchamel sauce), dipped in bread crumbs then deep-fried until golden-brown in colour. 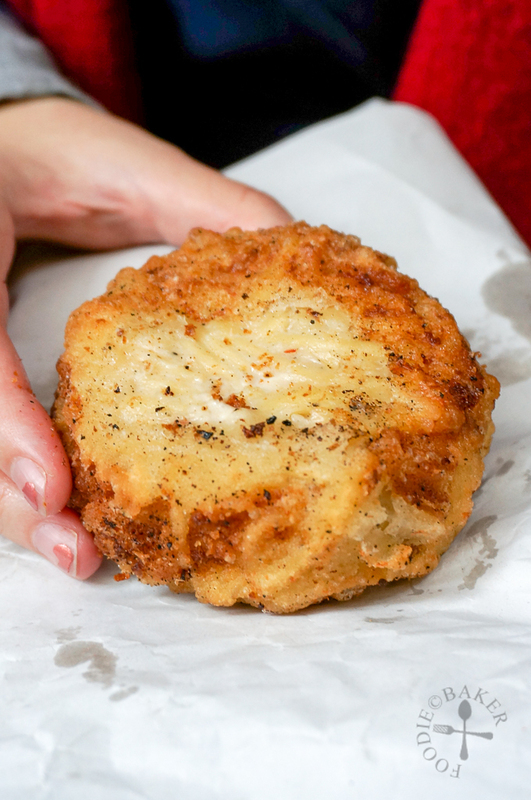 Think Mac n Cheese but in smaller, deep-fried patties! It was good but we wished it would be more moist, cheesy, creamy and have more a bit more meat. 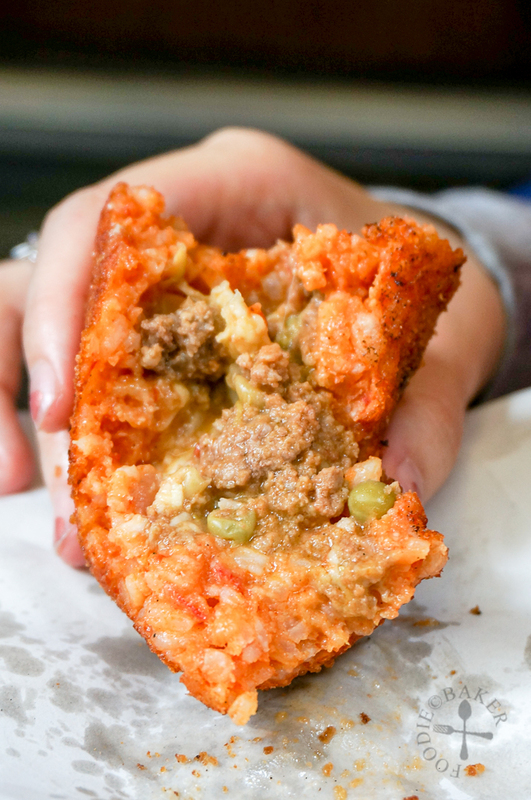 The most satisfying fritti we had from Di Matteo is the arancini – stuffed rice balls that are filled with a beef and tomato sauce, mozzarella cheese and peas. 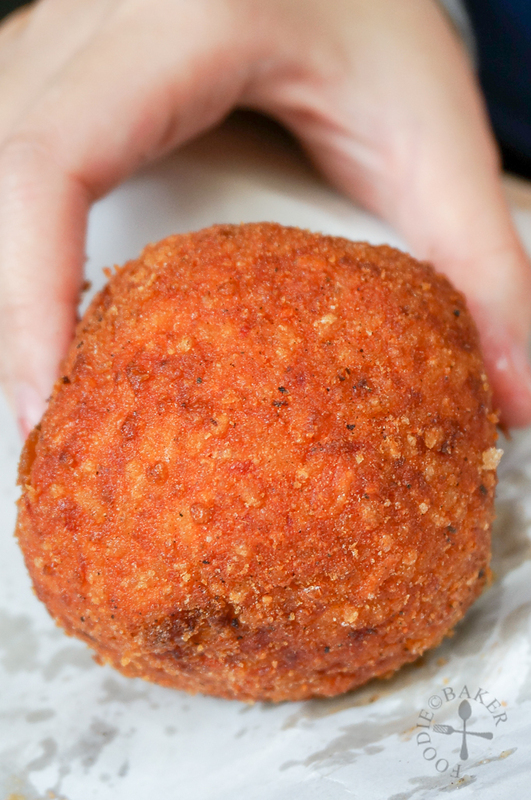 The arancini are extremely moist and juicy and it was so delicious! 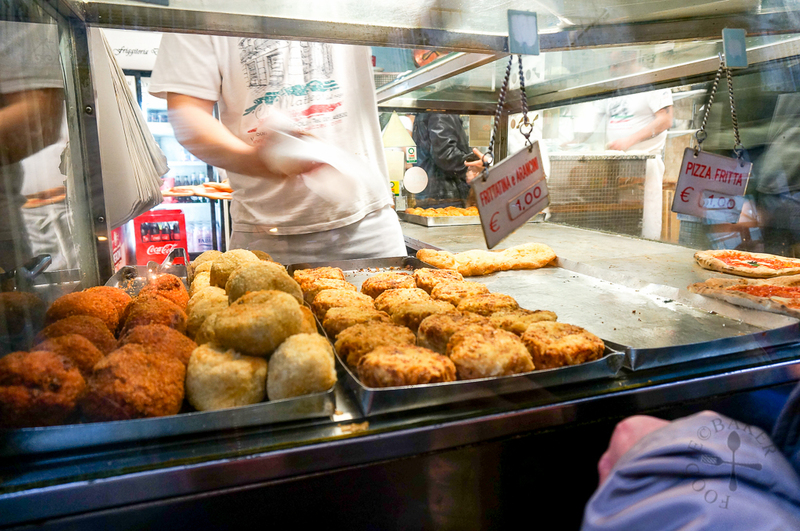 We were famished when we reached Naples but we were so stuffed after finishing the food we bought from Di Matteo – it’s no wonder as all of them are loaded with carbohydrates – dough, potato, pasta and rice! I was glad I only ordered 1 of each instead of 2! During lunch time, Di Matteo is crowded with people. Even the restaurant was full – a tourist told us that he and his wife had been queuing for 45 minutes for a table! In the evening, the crowd for fritti and mini pizzas diminished, but a queue starts to form again after 8 p.m. for the seated restaurant. We didn’t have the chance to dine in the restaurant as we had our dinner in another restaurant. 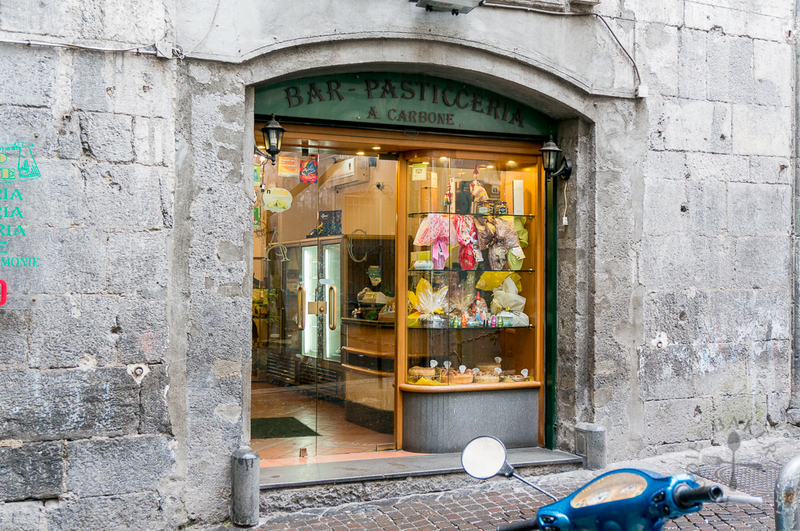 The weather in Naples on day 1 was cold and gloomy, and soon after we entered this pastry shop, it started pouring, perhaps a sign to tell us to stay here for a drink and a snack. 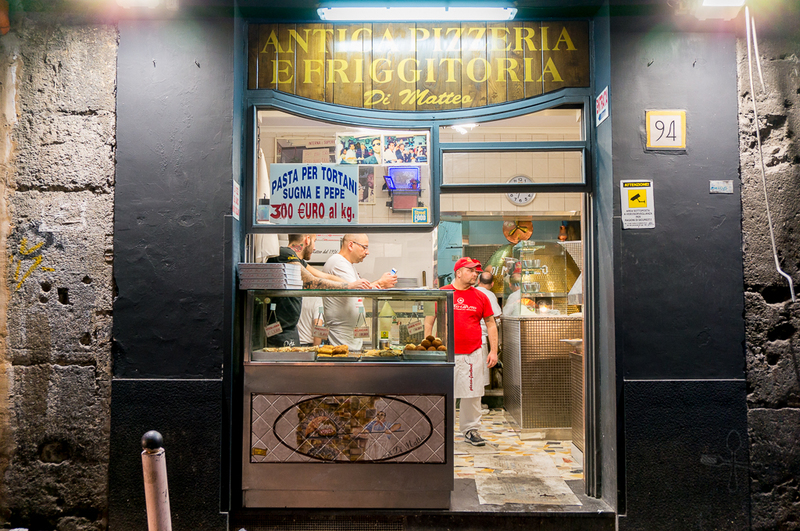 Situated in a small street away from the main and busy Via Dei Tribunali, Angelo Carbone was an old-school café founded in 1972. There is another branch located at the main street but it was small and a tad too crowded, so I actually prefer this one that is further as it’s quiet and calm. 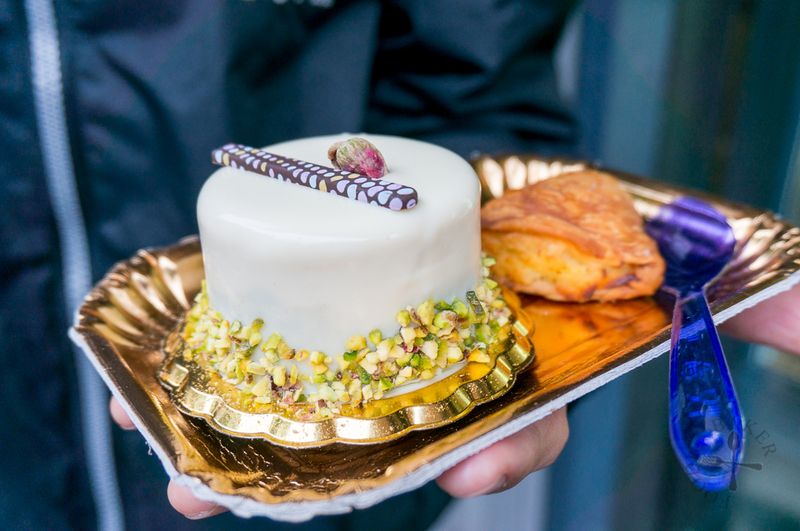 They serve a wide variety of pastries, many I have no idea what they are called. Next to the pastry section is a coffee bar, where we ordered 2 cups of coffee to keep ourselves warm. The one of the left is a small sponge cake ball filled with lemon cream, then coated with white chocolate ganache and white chocolate rice. This sweet treat goes well with the bitter coffee. 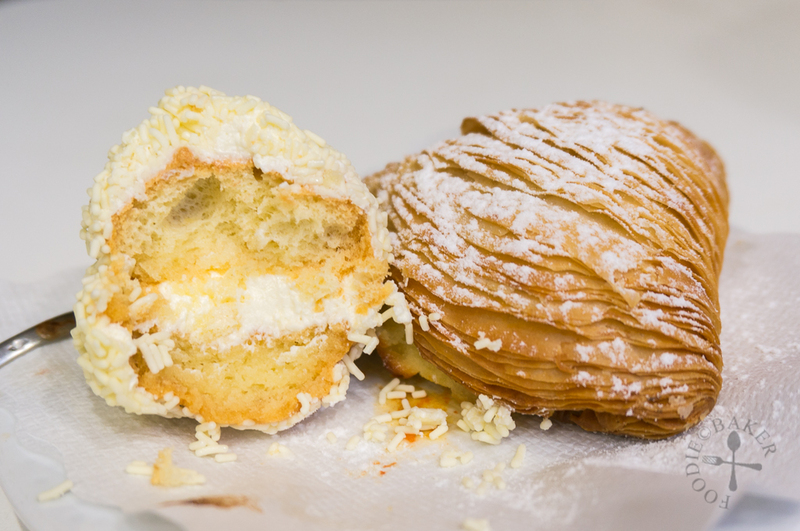 The other pastry is known as sfogliatelle, a must-try shell-shaped pastry filled with ricotta cheese in Naples. The one at Angelo Carbone is also filled with bits of candied orange. It is a delicious mess, with the crisp and flaky pastry flying everywhere when I cut into it. 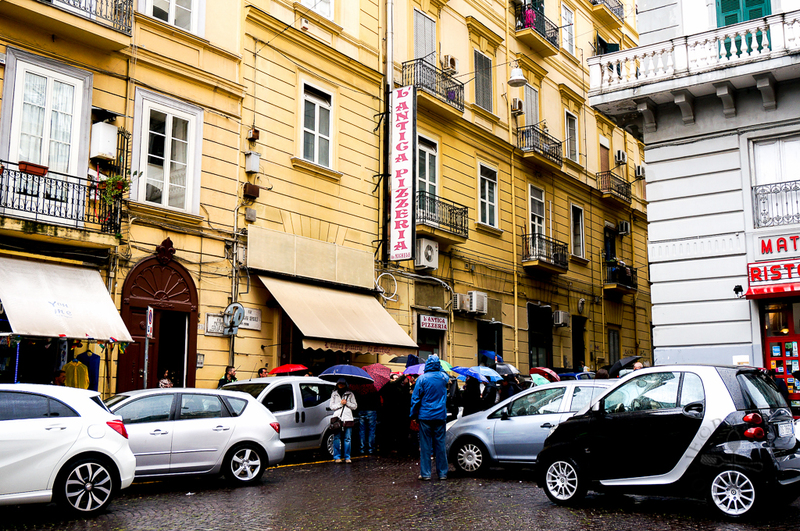 After the rain had stopped, we continue to walk around Naples, hunting for the next pastry shop. 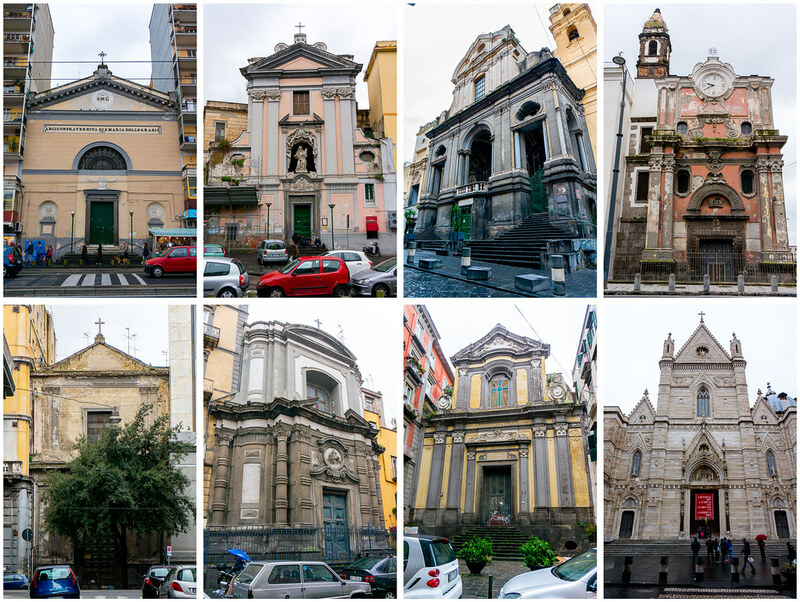 We noticed that Naples is dotted with churches – I tried to take photo of every church that we passed by, but there are simply too many – apparently there are about 500 churches in Naples! 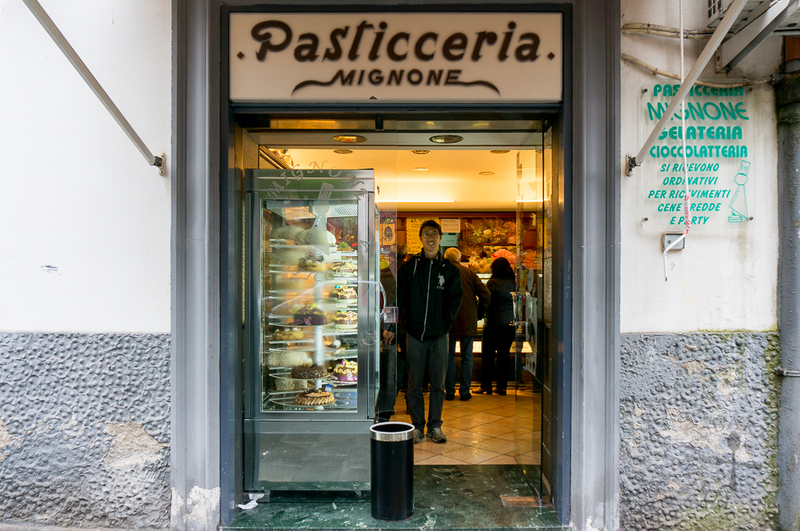 After some hunting, we finally found Pasticceria Mignone, an extremely busy pastry shop located in Piazza Cavour. 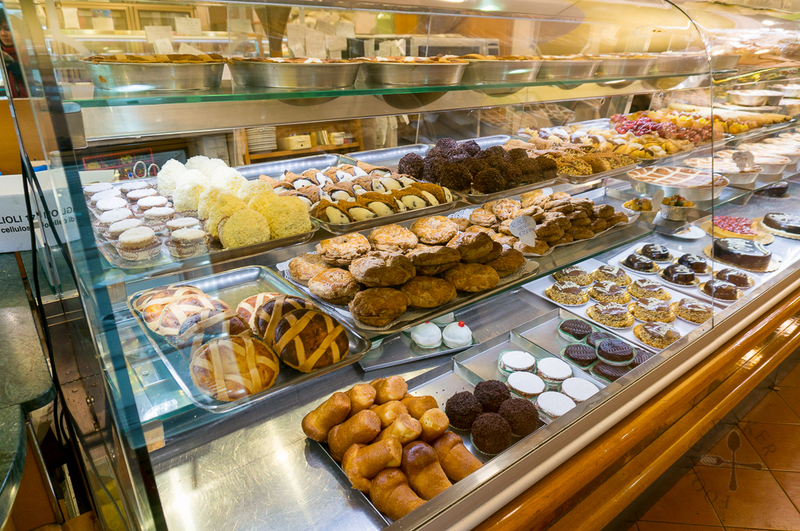 Many locals were streaming in and out of the shop, and with the wide variety of pastries they offer, I was a bit embarrassed for spending so much time to decide what to try. 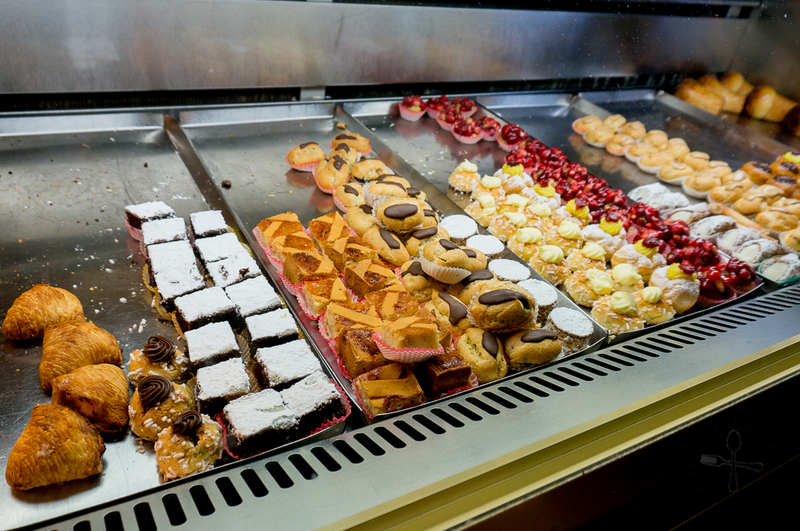 Wide variety of pastries – how I wish I can eat them all! 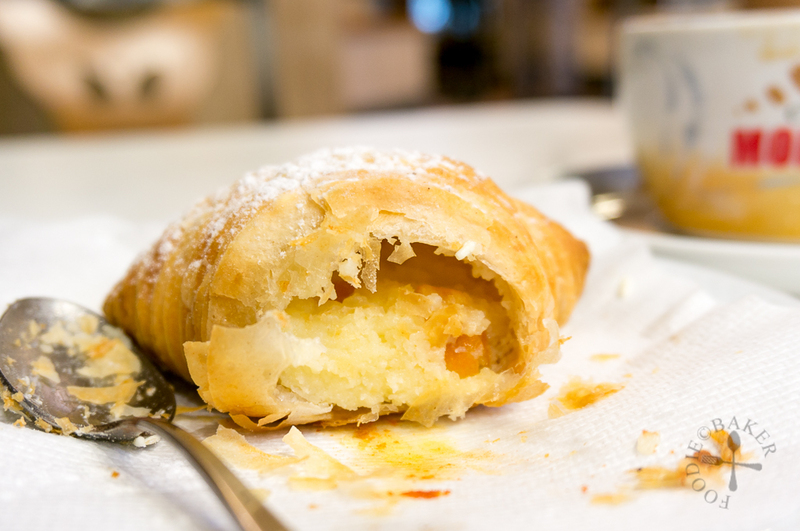 We tried the sfogliatelle which turned out a little dry and hard. But the other mini cake was sweet and delicious. 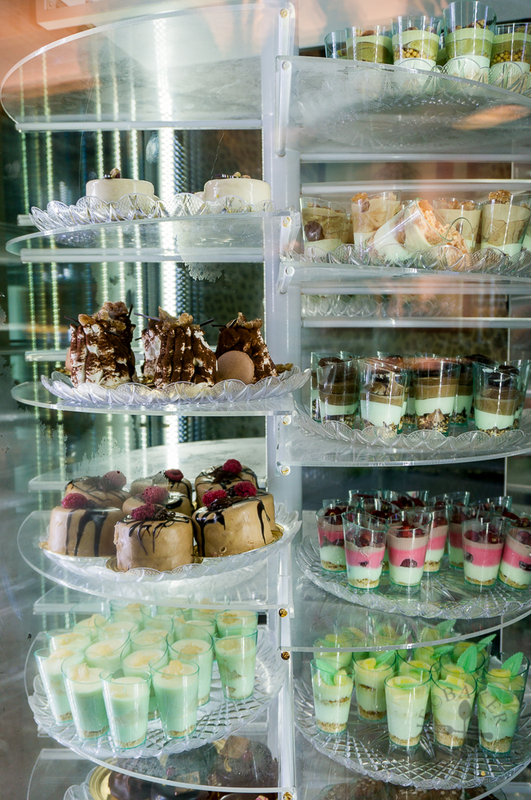 I couldn’t decide if it’s a mousse or an ice cream cake – the cake doesn’t look like it’s stored in the freezer (it’s stored in the tall display case) but the mousse (or ice cream) has a very smooth and melt-in-the-mouth texture, like eating ice cream! The top layer tasted like an Irish cream while the bottom tasted like pistachio. The creaminess is contrasted with the crunchy chocolate balls in the mousse, creating a surprise in every mouthful. 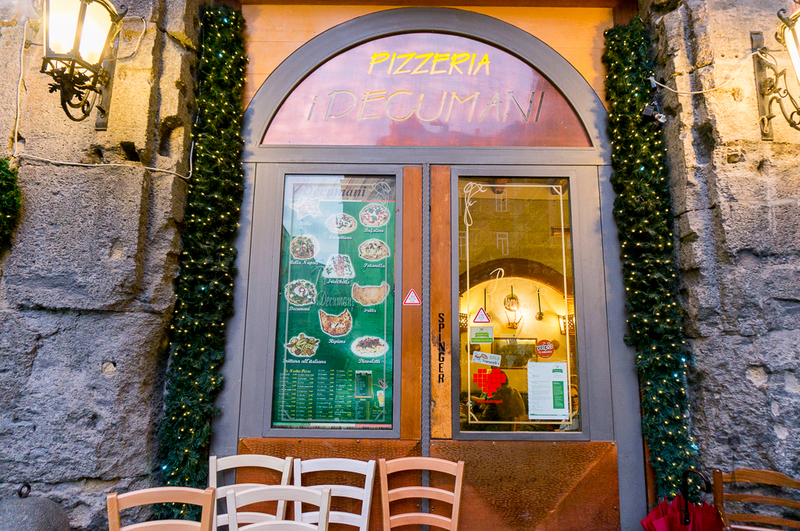 I Decumani was also a highly recommended restaurant while I was researching on the places to eat in Naples, so we decided to head there for dinner. The restaurant was full but the turnover was relatively quick so we didn’t have to wait very long. 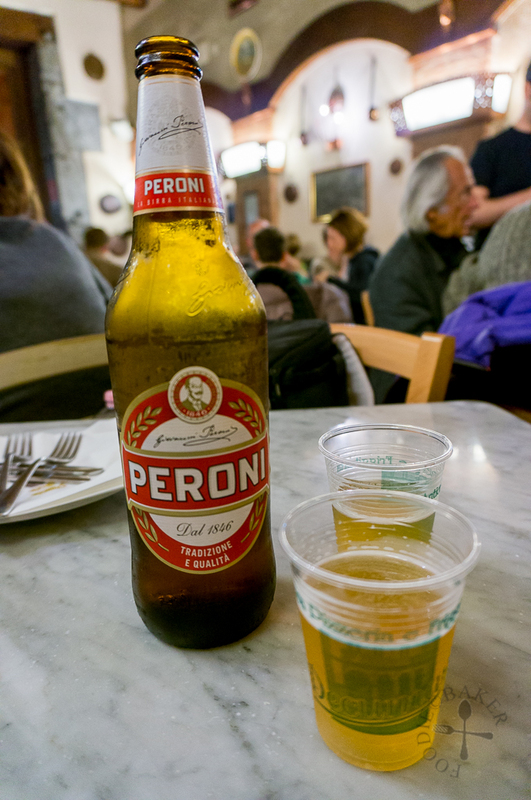 Even though we had our dinner after 8 p.m., we were still extremely stuffed from all the food and pastries we had eaten earlier, so we ordered only a bottle of beer and a pizza to share – which drew a “one-pizza-only?” stare from the waiter. 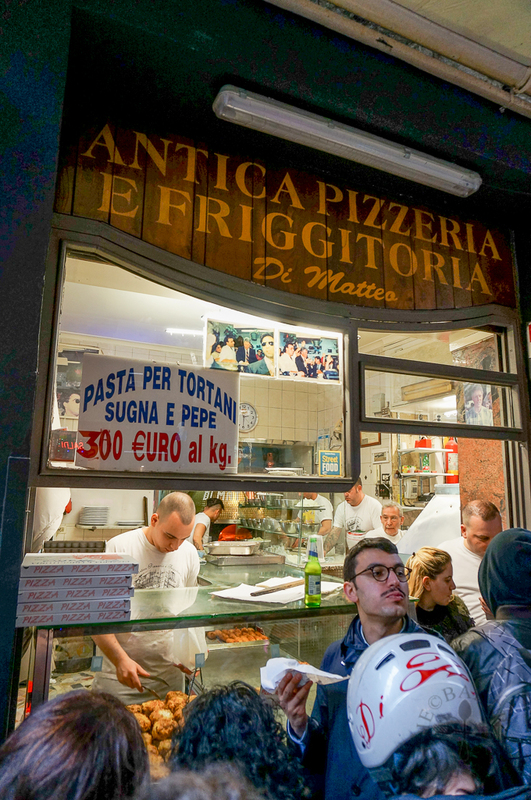 I guess it’s the norm to order 1 pizza per person in Europe but even if we were not filling full, we still wouldn’t be able to finish off 2 pizzas, because the pizza’s huge! We ordered No. 36, the I Decumani Special, which consist of sausage, salami, mushrooms etc. 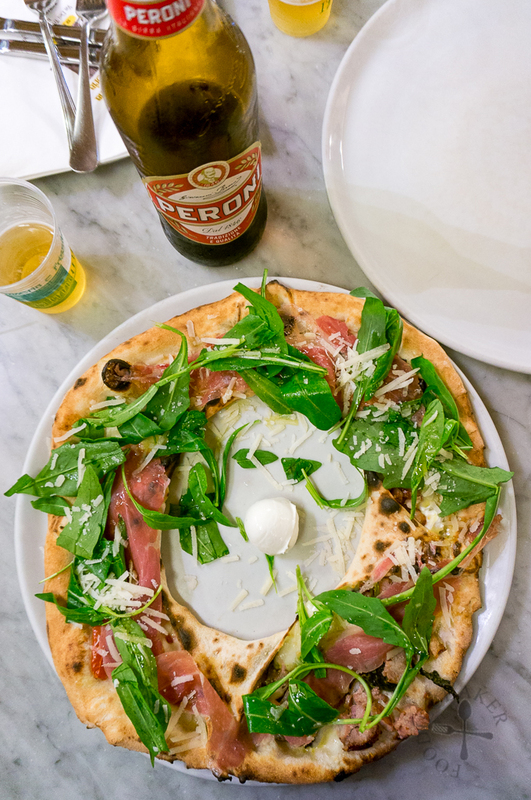 and after the pizza is cooked, it is covered with parma ham, flakes of parmigiano, argula and served with a ball of fresh mozzarella. It was extremely filling and tasty, if only I had the stomach to try more! Your post has made me very hungry 🙂 You found some wonderful food at reasonable prices, Jasline. I love the photos of all of the places you saw! whaaaat?! 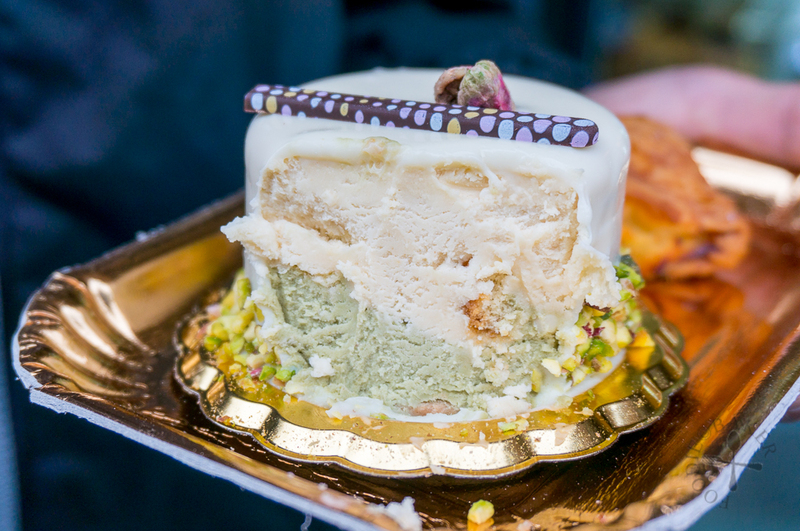 A day in Italy dedicated to eating all the yummy things?! I like the way you think! So much yumminess. Haha I guess I’m really lucky to have a day to eat my fill! Wish I can go back there and do it again! 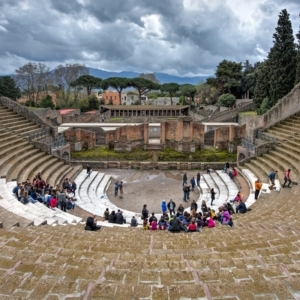 This brings back such wonderful memories of when I lived in Naples. The food, the beauty of the city, the people, the food (it’s so good I had to say it twice) Wonderful!